Our love of poppy seed desserts is obvious, from our Poppy Seed Cake to Mom’s Poppy Seed Roll. And the fresh flavor of lemon really amps up desserts, like these lemon-glazed blueberry muffins. The combination of poppy seeds and lemon is pure bliss. 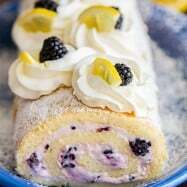 Lemon cakes are challenging because they tend to be dry. 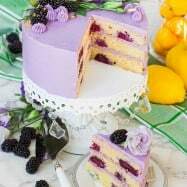 We made cake after cake until we landed on this combination which produced a moist cake with a soft crumb studded with poppy seeds and subtle and lovely lemon flavor. 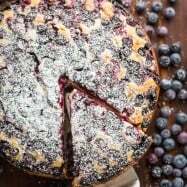 The softened butter and buttermilk were the key to adding moisture and great flavor to the cake. Can I Substitute the Fresh Lemon Juice? 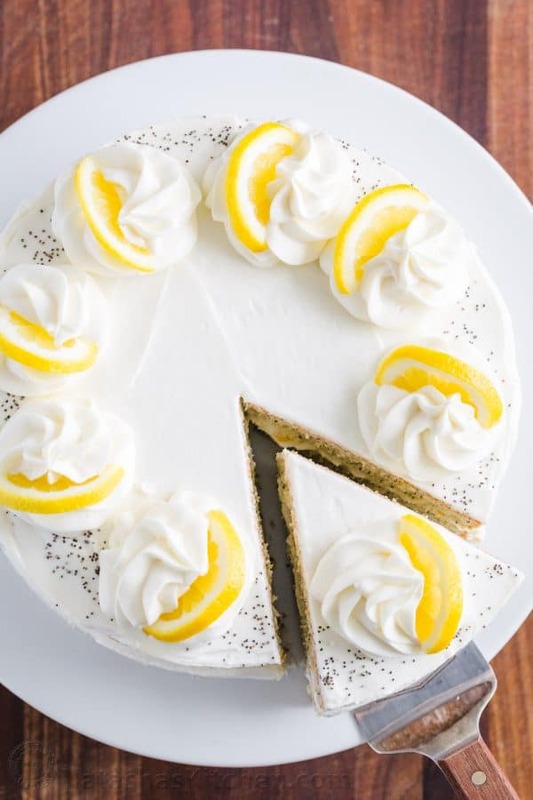 Fresh lemon juice is critical in this lemon cake and all you need is a total of 2 large lemons for the cake and frosting. Using both the zest and the juice will give you the best lemon flavor. Lemon juice from concentrate just won’t be the same. We haven’t tried lime but it’s worth experimenting for a lime flavored cake. 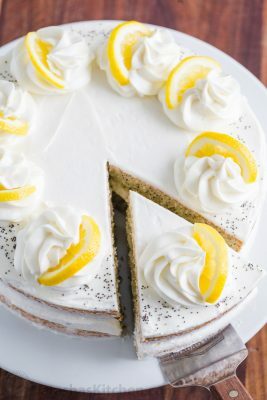 Can I Make this Lemon Poppy Seed Cake Ahead? This Lemon Poppy Seed Cake refrigerates well and we actually prefer it chilled for an hour or so for easier slicing. The little bit of cream cheese in the frosting keeps it from firming up too much in the fridge so you can serve it chilled or at room temperature. 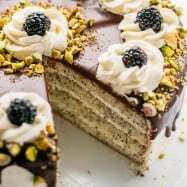 Plain cake layers – cool completely to room temperature then wrap fully in several layers of plastic wrap and keep at room temperature up to 2 days, refrigerate up to 5 days, or freeze up to 3 months. Frosted cakes – cover with a cake keeper (here’s ours) or use a large overturned bowl or even pot (just be sure it has enough clearance for the width and height of the cake. Refrigerate cakes covered to keep them from drying out or absorbing refrigerator odors. 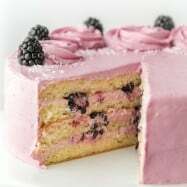 Sliced Cake – once a cake has been cut, it starts to lose moisture. To keep it fresh, lay a piece of plastic wrap against the cut side then cover as you would whole frosted cakes (see above). Have all of your moist ingredients at room temperature. Butter, eggs, lemons and buttermilk should be at room temperature before using. Room temperature ingredients incorporate much easier for an even-textured batter and improved rise. When to take ingredients out? Timing depends on your room temperature so take ingredients out at least 1 hour before or 2 hours before to be sure. Read through the recipe before starting so you know what tools are needed for a recipe and aren’t frantically looking for that whisk when you need it. Pre-measure everything so it’s ready to add as you follow the recipe. Measure ingredients correctly – use the correct measuring cups and spoons for wet or dry ingredients. The way you fill matters, i.e. 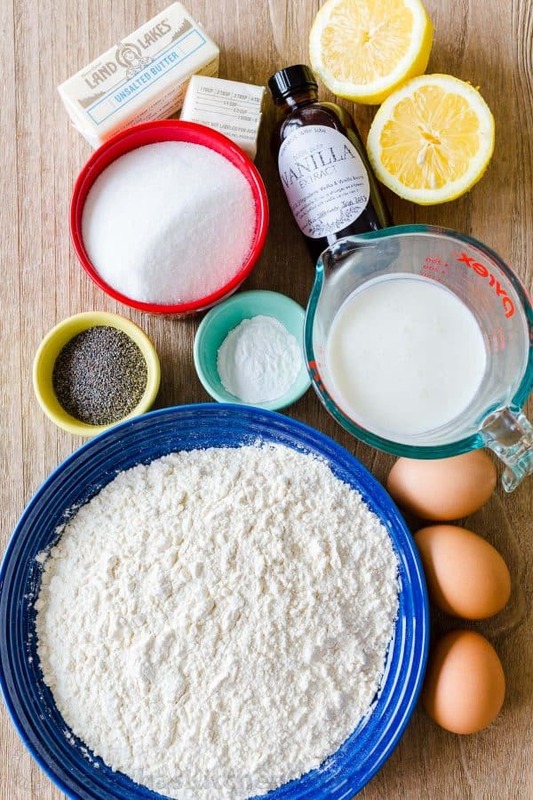 for flour, use the spoon and scrape method instead of plunging your measuring cup into a bin which can give you 25% more flour, resulting in a dense cake. Keep the oven door closed, opening it only to test for doneness at the end. Baklava – lemon is the secret for the best baklava! 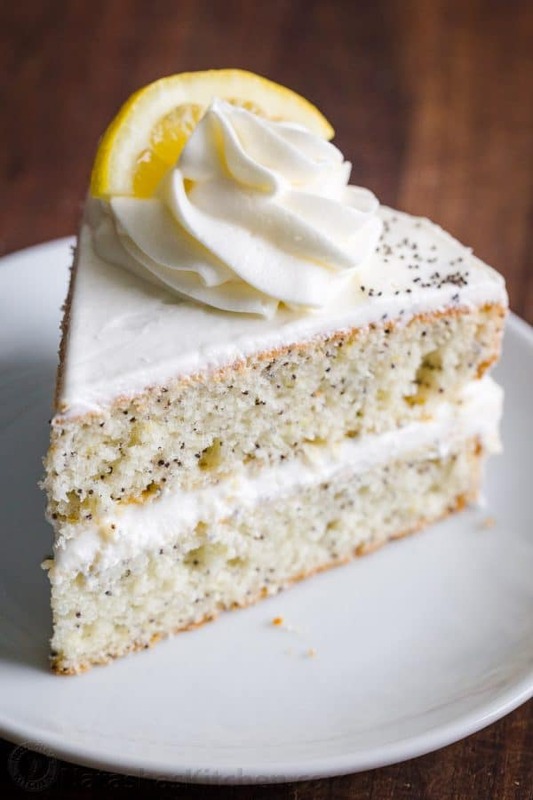 This lemon poppy seed cake recipe is simple to make and satisfies that craving for tangy sweetness and poppy seeds. I hope this becomes a new favorite for you! 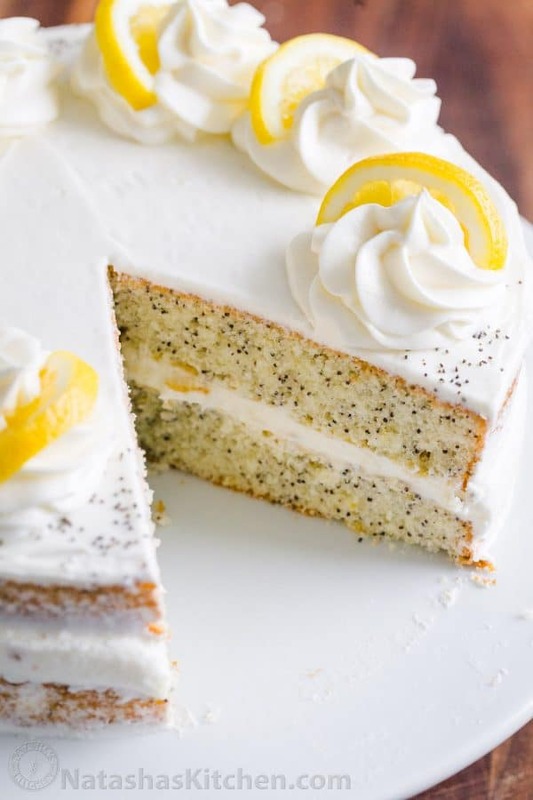 Lemon Poppy Seed Cake is soft, moist, easy to make and has wonderful fresh lemon flavor. 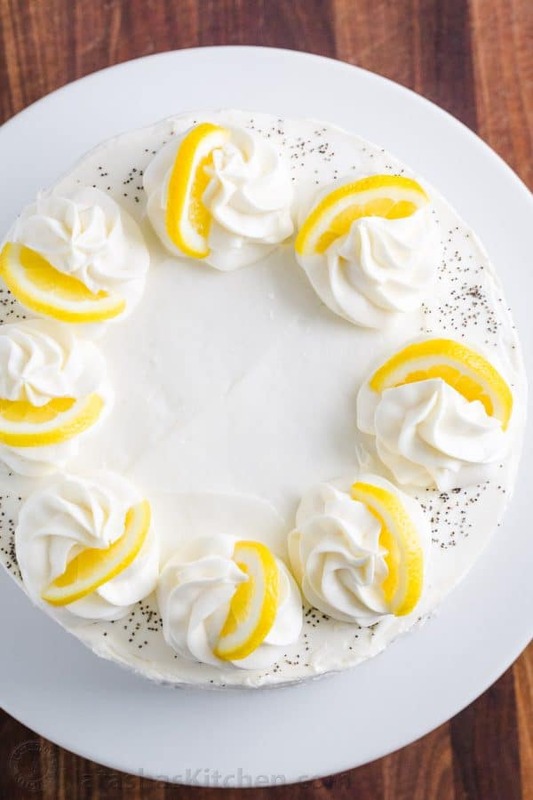 The whipped Lemon Buttercream Frosting is incredible! Preheat oven to 350˚F with a rack in the center of the oven. Butter the sides and base of two 9" cake pans and line the bottom of each pan with a ring parchment paper. In a large mixing bowl with an electric hand mixer, cream together 12 Tbsp softened butter and 1 cup sugar for 2 minutes on high speed. Add eggs one at a time mixing just until incorporated. In a small bowl, whisk together 2 cups flour, 2 1/2 tsp baking powder and 2 Tbsp poppy seeds. Add half of the flour mixture, mixing just until incorporated. Add 2 Tbsp lemon juice, 1 Tbsp lemon zest and 1 tsp vanilla, mixing just to combine. With mixer on low speed, add 1/2 cup buttermilk then mix in remaining half of the flour mixture, mixing until no lumps remain. Divide between 2 prepared pans and spread evenly. Bake at 350˚F for 20-23 minutes or until a toothpick inserted into the center comes out clean. Let cake cook in pans 10 minutes then transfer to wire racks, remove backing and and cool to room temperature. Once completely cooled, place the first cake layer on a cake platter and spread a generous 1/3 of the buttercream frosting over the top. Place the second layer of the top (flat-side-up) and spread 1/3 of the frosting over the top and sides. Sprinkle the edges of the cake with poppy seeds if desired. Pipe remaining 1/3 of the frosting as desired over the top and place a slice of fresh lemon over each puff of frosting. 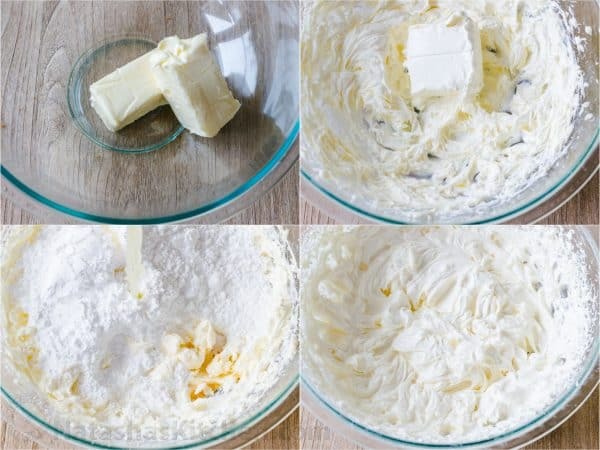 In a large mixing bowl with an electric hand mixer, beat 1 cup butter on high speed until smooth and creamy (2 min). Add 4 oz softened cream cheese and beat until completely smooth. Add 4 cups powdered sugar, 3 Tbsp lemon juice and 1 tsp vanilla and beat on high speed until whipped and fluffy (5 min). The lemon cake base was adapted from Sally’s Baking Addiction lemon cake. Sally is an incredibly talented baker and great resources on all things baking! 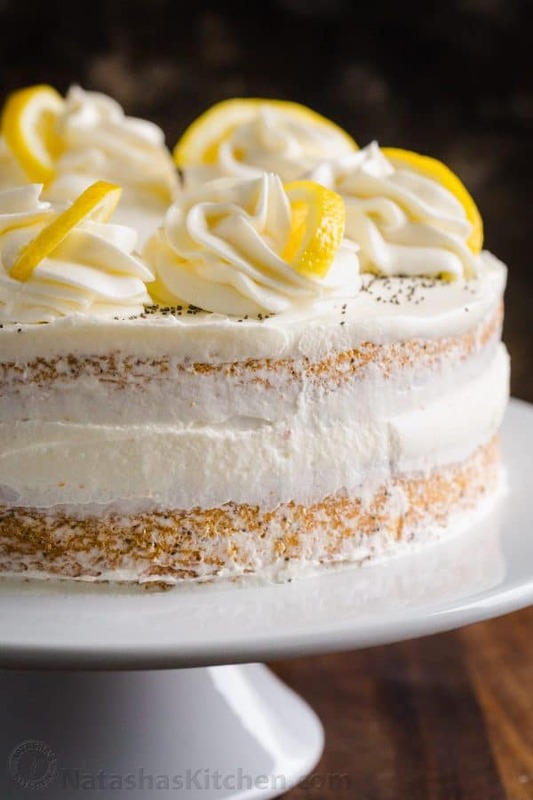 Poppy Seed Sour Cream Cake with Custard – take a peek inside! I have tried most of your cakes with success but with this one I’m having few issues. My cake didn’t rise as much as yours , also just made the icing and it’s not thick enough to pipe I think, turned out bit runny. Should I add more butter or icing sugar to fix it? I measured everything correctly and not made any changes. After I assembled the cake i refrigerated and it was fine when i took it out. Thank u ! Can I bake in one pan instead of 2? I don’t have 2 round pans.